Friends who know me know I love living in NY City. Like most NY’ers going into the City (Manhattan) is something of a big deal…because it’s challenging at best to park and planning for public transportation is a pain. 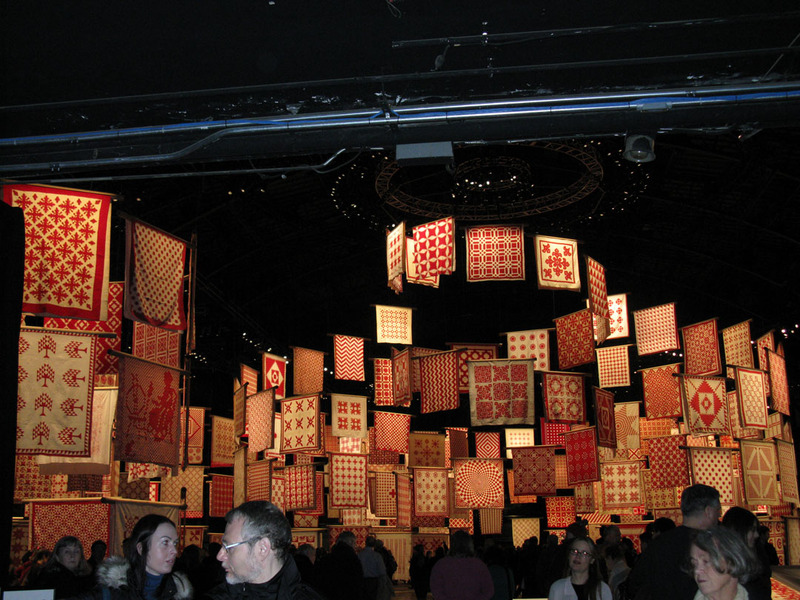 My motivation yesterday – the Empire Quilt Show and the Red & White Quilt Exhibit at the armory. I spent a few minutes on hopstop planning my trip, texted myself general directions ie what train and where to get it. Fortified with a delightful breakfast my sweetie made off I set to enjoy this (annoyingly) cold day. As the bus wended it’s way into Manhattan I played around with a zentangle drawing. I had to be rather careful and time for when the bus stopped to do some drawing (will post this at a different time). 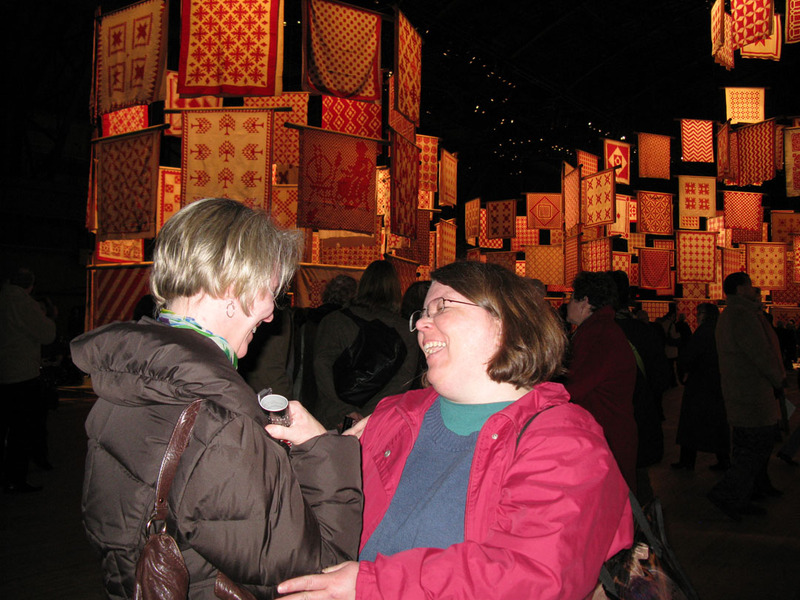 My original plan was to go to the Empire Show, The City Quilter and then the Park Ave. Armory. Sometimes plans change and it’s a little bit fun. I got off at 71st St. and headed over to the Armory to see the Red & White Quilts, not realizing the show opened at 11 and I arrived promptly at 10. Onto the original plan…I checked my text’s got the directions from FIT to the Armory and used them to get downtown. Yay! I did it. I exited the subway at the right stop and enjoyed the quilt show. Part of enjoying the quilt show is meeting quilters – yesterdays were a mixture of students, MetroMod Guild Members and vendors. I met Victoria of Bumble Beans, the MetroMod Guild meets at her place. While I’ve been a member for a while I have not yet attended a meeting. I can’t attend the next one either since I’ll be in ME next weekend. Victoria and I chatted for a bit, she’s quite lovely and had a quilt or two in the show. 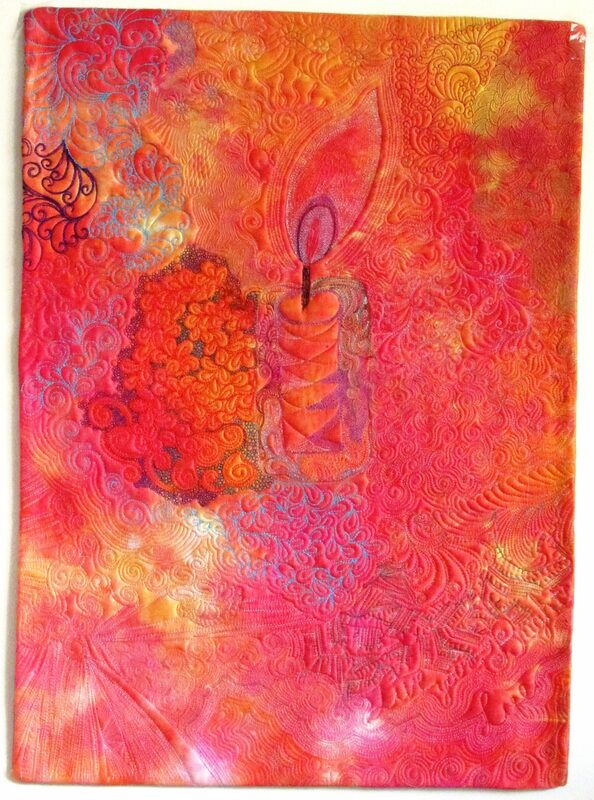 We’ll be talking about a machine quilting class for guild members. Lisa Shepard Stewart and I have tried to chat at both the AQS and this show, thankfully her booth was busy! She gave her trunk show yesterday (which I missed as I dashed off with a few quilters to see the Red & White Quilts). Sorry Lisa!!! We will set up the wine & fabric pairing in the fall. If you get the e-newsletter from the City Quilter you know they’ve been in the process of expanding for a while. They’re finished and the added space is delightful! They were well equipped to handle the crowds yesterday having 4 cash registers and 3 cutting stations open. I shocked myself and my friends and didn’t purchase anything at the shop (I did purchase yarn at the quilt show). If you get a chance to go in and see their new digs it’s well worth it. They’re now a Bernina dealer and have space to try out the machines. When we arrived at the Red & White exhibit I handed my camera off to Lisa, our non-quilterly friend (we’re working on that) and let her have at it. My batteries were fresh and she was quite keen to take photos. A very quick tutorial on the camera and off she went. Lisa shot this pic of a friend and I. I didn’t know she was coming into see the show – even had tickets to see Alex Anderson & Paula Nadelstern in a discussion moderated by Meg Cox. By the time I found out about this the show was already sold out! I asked E to say hello to Alex for me if she got the chance to talk to Alex. After walking around and enjoying the quilts we made it to the rear of the Armory where a little cafe was set up. We enjoyed a cup of coffee or tea and shared a flourless chocolate cookie. Ooooooo it was delightfully gooey. so we decided to have a little fun – the pose is kinda like the announcer guy from Rowan & Martin’s Laugh-in! We had a great time and I was happy to get into the car with them at the end of the day and head towards Anne’s house. 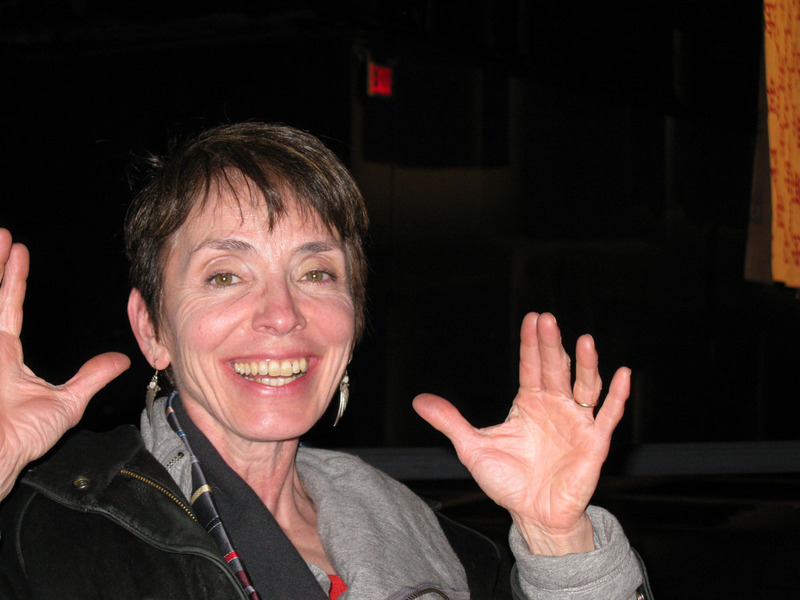 This is Lisa – who took all of the pictures. The quilts were hung in such a way that they looked, at least from this perspective like they were spiraling down to the floor. I’ll share more of these in a few days. Right now I’m off to shower & quilt! I love the way the quilts were hung at the red and white show. Mrs. Rose must have really enjoyed seeing all her quilts hung up for show. I would have liked to see them! What a wonderful show and what a great time it looked like you all had! What an awesome day! Thanks for sharing! Now that is a fun day!!!! 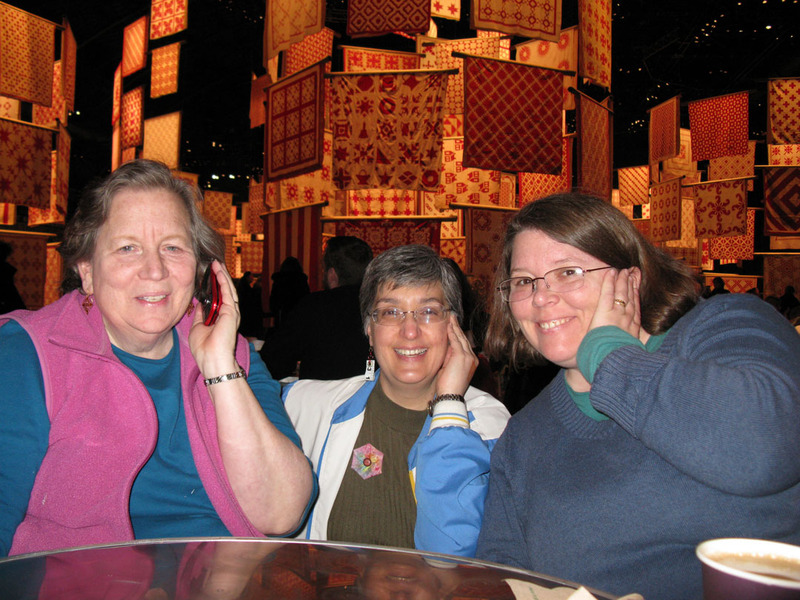 Quilts, quilt show and friends..can’t get any better!! !